A couple of months ago, I came up with this really quick (5 minutes) and easy style for which I received quite a few requests for a tutorial. I haven’t figured out how to do videos yet, so I figured I’d do a slide show tutorial. I think it’s pretty self-explanatory. However, in case it’s not, here are written instructions too. One thing to note, I did this style on week old hair that was stretched in twists and twist outs the prior week. Move loose hair all to one side and over the shoulder (I chose the left side). Create 7 twists from front to back on the left side leaving hair from over opposite ear and lower nape loose. 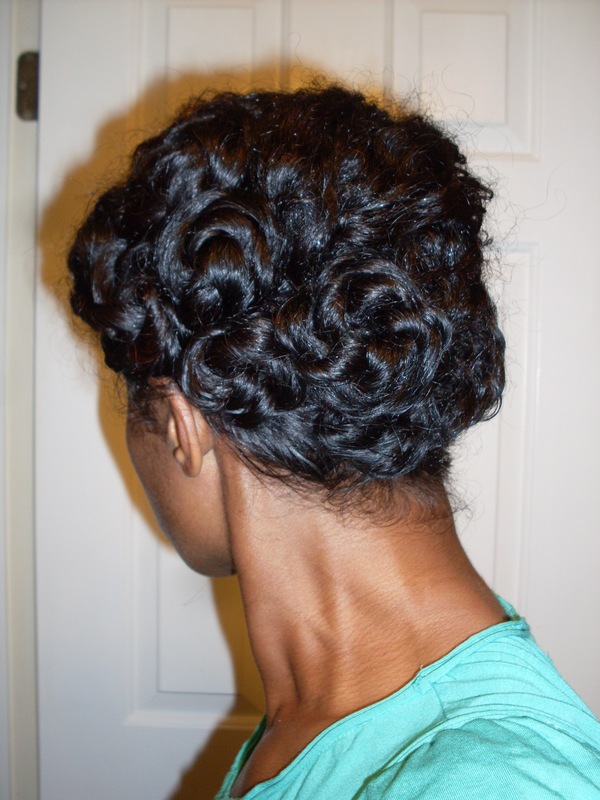 Pin-curl twists (roll twist around finger, lay flat and pin down with bobby pins). After I took these pics, I misted lightly with a setting spray (Elasta QP) and smoothed my edges with a little Eco styler gel mixed with Carol’s Daughter Healthy Hair Butter. I then tied my hair down with a satin scarf and put on a bonnet for the night. I think I can repeat this routine nightly and I should be able to get 3 days out of this style, even with exercising (with a scarf). Hope that this is helpful!! Yahh thank you for the tutorial. I hope I can get my hair looking somewhat decent. Still need more length in the crown. Ahhhh, I’ll have to figure that one out tonight! Cool! Thanks Michelle! Can you please do a video tutorial on this? I love this style. I can’t say when, but yes I’ll do one=). I love this style very elegant. Admiring your hair really makes me wish mine was thicker. I noticed you stated you hair isn’t as thick as it appears do you have any tips getting fuller hair? oh this is so stinkin cute! I am transitiong now (about 9 mths in). I cant wait to try styles like this one once im fully natural. Awwww thanks ladies!! I’m all a day late and a dollar short!! LOL!! Leslie, coolio;)!! Sheena, girl, frizz! LOL!! I haven’t really found anything to make my hair thicker! Henna actually makes the individual strands a LITTLE thicker, but because it loosened my curl, I think my hair doesn’t look as thick! So, I get big hair just by releasing it when it’s a little damp or using a non-pH balanced conditioner. However, one of my other readers, Rhonda, just sent me an article on thickening product lines and Pantene Full & Thick Collection was at the TOP of the list (see link below). But, if you avoid cones, I suspect that this may have them, so it wouldn’t work you. I just may try it though! !